"Buy Where You Ride" is promoted by the Ontario Federation of Snowmobile Clubs (OFSC) as a reminder to each snowmobiler that they should purchase their trail permit form the club that maintains the trails they ride the most often. Snowmobilers who purchase more than one permit could also consider dividing their purchases among clubs of different area/regions depending on where they ride. This decision is not as easy as it used to be, as many snowmobilers are now riding longer and farther away from home base. In this case snowmobilers may travel of the trails of several clubs during the day. On the other hand, some snowmobilers rarely leave thier own local trail system. Quite often snowmobilers purchase their trail permit where it is the most connvenient instead of the area that they ride the most often. Others wait until the last minute, December 1st, to purchase the permit at a lower price. In these cases the permit money goes to a club whose trails a snowmobiler seldom if ever rides. This means that the club whose trails a snowmobiler rides the most often doesn't benefit from the money from the purchased purmit while another club does benefit even though a rider will seldom if ever ride that club's trails. Both your local club and the OFSC are non-profit organizations with a mandate to put most of your permit money to work on the trails you ride. Because this permit money goes first and foremost to the selling club, it is in your own best interest to ensure that you buy from the local club whose trails you ride the most. 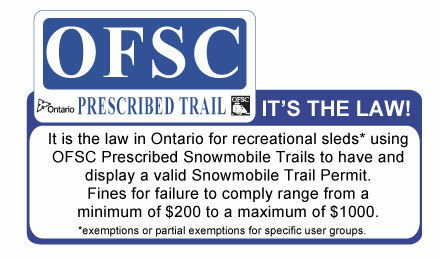 Ontario snowmobile clubs pay for grooming by selling Trail Permits. By buying yours form the local snowmobile club whose trails you ride most often, you help ensure that its trails are well groomed all winter. Buy Where You Ride is a basic principal of the OFSC user pay system that says: pay your money to the club that gets your traffic; invest your permit money on the trails you use the most. It's only fair to the club and you'll feel the differnce too!